The other day I went to visit my bloggy friend Tereza from Cityscape Bliss. In her usual sassy fashion, she made me envious of her style by wearing a lovely, long cardigan. I’ve always assumed that full length cardigans would look awful on me because I’m so short, but Tereza isn’t so tall herself, so I’ve been obsessing over getting one of my own ever since. After a few days of ONLINE SHOPPING TURMOIL, I stumbled upon this geometric knit cardigan from Forever21. When I saw the price, I couldn’t resist. This heavy weight beige and black number only set me back £26, and when you sign up to their mailing list they also send you a £5 off code. Bazinga. I’ve always been a little apprehensive of buying anything from the F21 website, as I know their sizing can sometimes be a little hit and miss, but if in doubt – always go for Medium in there (if you’re a size 10 like me, obvs if you’re smaller or bigger go for another size like). Delivery was surprisingly good as well. I always assumed Forever 21 delivery would either be really expensive or really slow. It cost me £3.95 and came 2 days after I ordered it. I don’t know if you’ve ever ordered from H&M online, but their delivery methods are awful and once I waited about 2 months for a pair of shoes. I’m not sure why I always viewed Forever 21’s website on a par with H&M, but I can confirm that I was silly and there was no problems at all with my order coming in a suitable time frame! 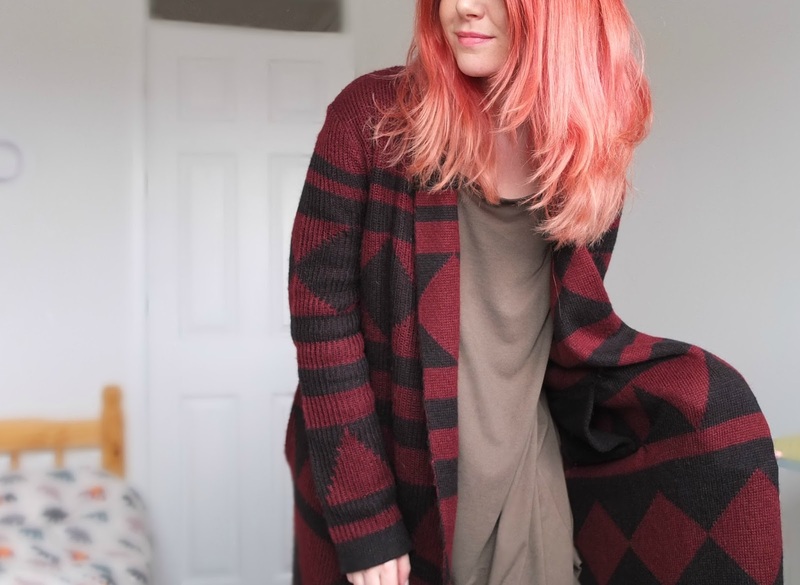 The cardigan itself is a lovely, snuggly, heavyweight knit which was surprising considering the price! Thanks Forever 21 for curing my itch for a full length cardigan in the best possible way. I think this is my new favourite garment, ever.